This Feature Selection Software by means of a Wrapper System of our own design is based on models and it is suitable for researchers trying to determine relevant features and their relations in big data sets and the output models regarding the inputs. This tool enables dimensionality reduction in large datasets via modelling, classification or recognition of patterns. 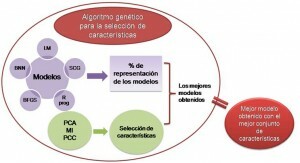 A genetic algorithm selects the features that produce the best models or classification systems, that is, where the highest representation percentages are found-best prediction models-. It also enables the modelling and classification while disregarding the features, which is suitable when the number of features is low. The application allows using 5 different model validation tools.